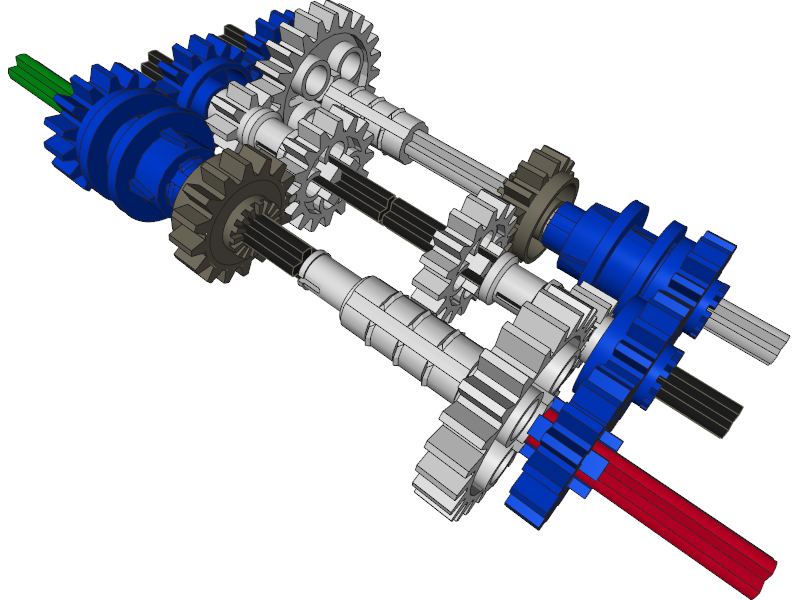 New gearbox concept – a 3-speed sequential synchronized pneumatic gearbox that can be operated entirely remotely. The gearboxes are very useful even today, with the speed control feature available with the Power Functions system. They are even more useful when they are remote-controlled, because this way the vehicle doesn’t need to stop to shift gears – instead, the gears can be shifted while driving. 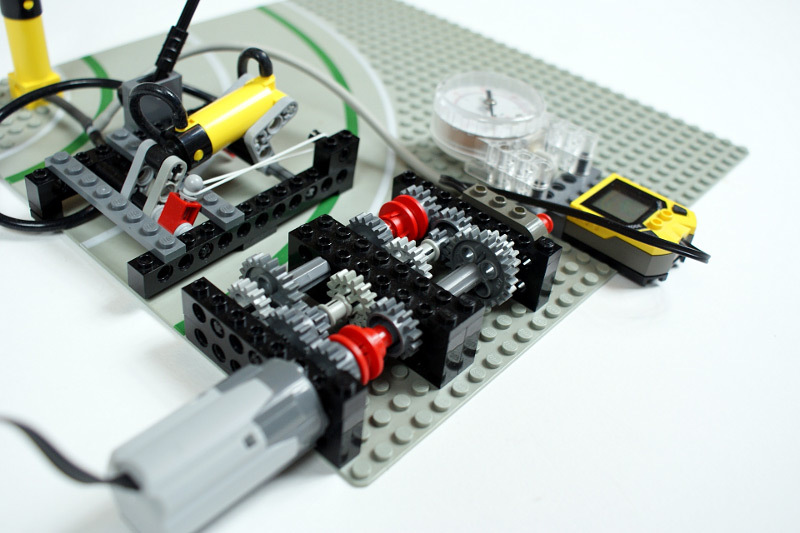 This type of gearboxes can work just like the real ones: it can have some gears that are unable to start the vehicle, but can speed it up once it has some momentum already. The easiest type of a remote-control gearbox is a 2-speed one, because it can be easily motorized like an end-to-end device; it can shift between 2 gears with a single motor easily. 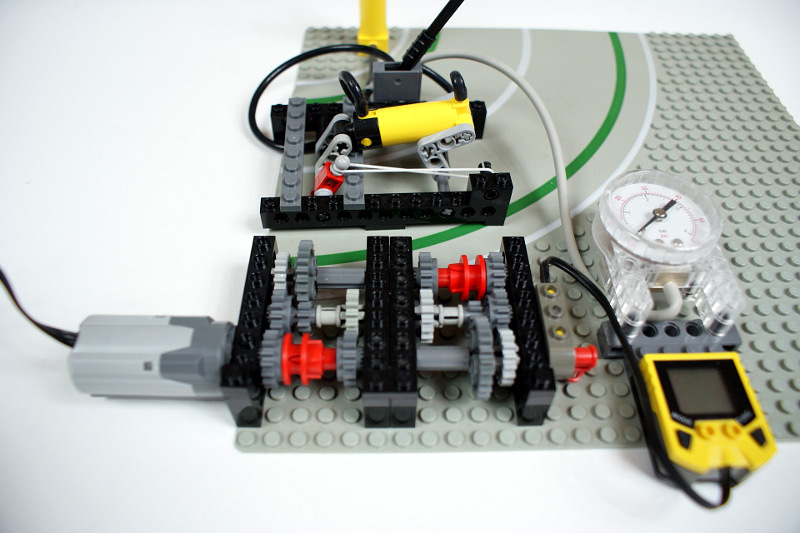 I always wanted to build a remote-controlled gearbox that would have more than 2 speeds and still require only a single motor to be operated. It was eventually achieved with the AeroShift gearbox (I made up that name because the ‘3-speed remote-controlled sequential synchronized pneumatic gearbox’ didn’t sound too catchy ;)). This gearbox is, as mentioned above, sequential, which means that it can’t shift from any gear to any gear. Instead, it has to shift through gears in a sequence, e.g. from 1st to 2nd and then from 2nd to 3rd. This type of gearbox is quite popular in motorbikes. The gearbox is also synchronized, thanks to the use of the driving rings, on assumption that it would be troublesome to watch for grinding gears in a gearbox that’s supposed to be operated remotely. If you look closely enough, you’ll notice that the gearbox consists of two identical modules set as ‘mirrors’ of each other. It is perfectly possible to build more than two modules – the first one will provide two speeds, and each next module will provide one extra speed (hence 3 speeds with two modules). The gearbox would have 5 speeds with four modules, 7 speeds with six modules, and so on. I did not attept to use more modules, because for me 3 speeds with a gearbox of this size was a good solution, while 5 speeds with a gearbox twice as large was not. Additionally, it would require more than a single pneumatic cylinder to be operated, and thus greatly complicate the pneumatic system. It should be mentioned that this gearbox can be operated without pneumatics. It would, however, require a number of gears, including gears with clutches, as well as a mechanism that would work like a stepper motor. Since a single pneumatic cylinder can replace all these mechanic parts, I have chosen this solution as a significantly simpler one. The picture above shows a testing setup. The pressure gauge and speedometer are obviously not needed for the gearbox to work, and the pneumatic valve is supposed to be operated by a motor. The parts that are important for the proper functioning of the gearbox and may not appear so on the photo include the rubber band which makes sure that the driving rings are switched sequentially, not simultaneously, and the grey thin plates described as ‘limiters’ above, which make sure that the movement of the pneumatic cylinder is contained within a desired range. The cylinder can be mounted with its inlets pointing downwards to take less space, but it requires placing the pneumatic hoses in such way that they don’t interfere with the moving parts of the gearbox. I believe that this photo along with the ones that follow it are sufficient to build a copy of this gearbox, so I will just list the pros and cons of this gearbox according to my observations. Pros: relatively small size, ability to handle huge torque (the critical elements are the driving rings that tend to disengage when too much torque is applied), convenient location of the input and the output, identical functionality for the driveshaft rotating clockwise as well as counterclockwise, and a minimal chance of the mechanical failure in the gearbox (e.g. because all the gears that transfer the drive are encased in solid bricks). Cons: uses pneumatics, doesn’t work well with high air pressure (it causes strain on the driving rings and thus slows the gearbox down, so use of an airtank with this gearbox is not recommended), is sequential (impossible to omit the middle gear, though it can be switched through it really quickly) hitting the medium gear precisely can be tricky (depends mainly on the proper calibration of the rubber band and the pneumatic pressure in the cylinder), the gears are shifted relatively slowly, and there is a number of dead gears that generate additional friction. 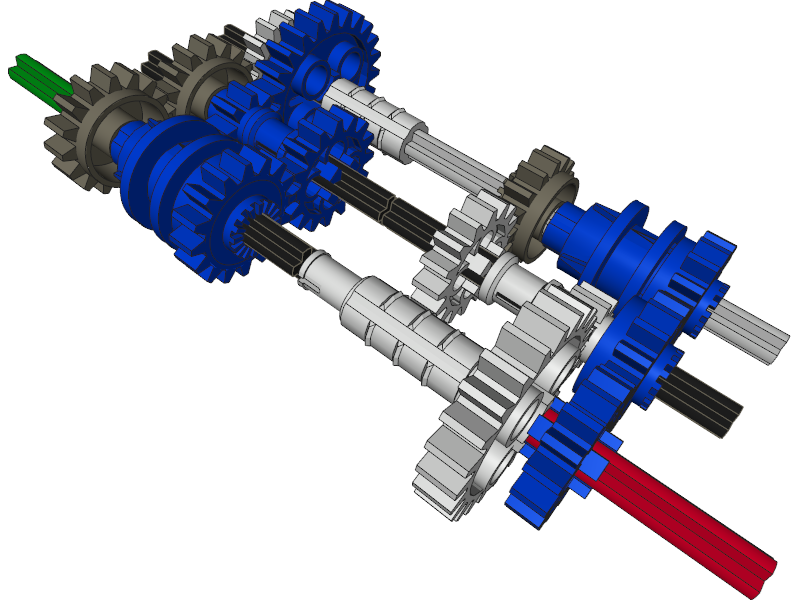 The gearbox offers the following gear ratios: 1:1, 3:1 and 9:1. If these differences are too large for your use, it is perfectly possible to replace the 8t & 24t gears pairs with 12t & 20t gears pairs. It will result in the gear ratios changed to 1:1, 1.66:1 and 2.77:1, while the functioning of the gearbox will remain the same. Oh that idea is great! Because it has a worm gear inside and won’t yield to a rubber band. Why wouldn’t the rubber band work on the linear actuator? You could, but it would be more difficult to control. The rubber band won’t work on a linear actuator. This is an awesome gearbox. 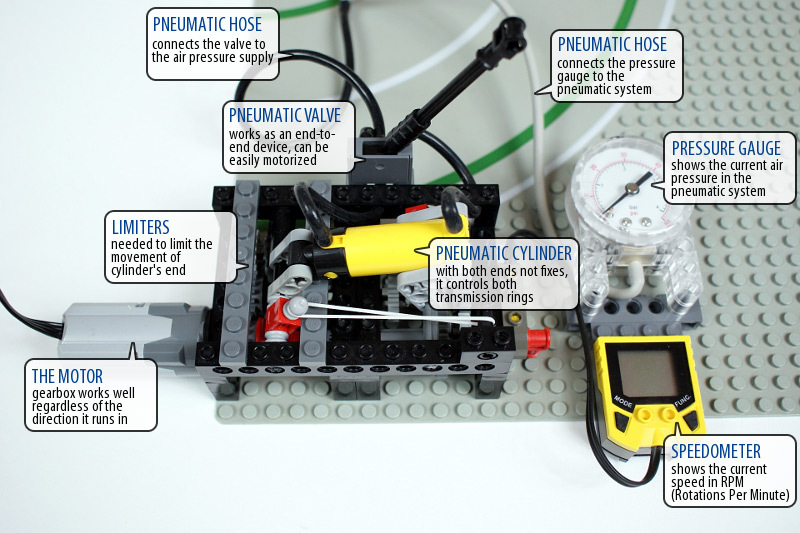 But, instead of pneumatics, could you use a linear actuator? If not, why? Could the pneumatics be replaced with the new mini LA? Wow…we come from different countries but we had the same idea. I developed a sistem for chancing the gear by a small cilynder. I don’t think it will make a difference. Sorry. Anyway, I have approximately worked out the price now. Do you really think it makes difference given the size of this battery? Can’t you order it if you don’t know the weight down to 0.1 g or what? Please tell me if you have weighed it with the battery in or not. The link I gave you shows the weight too. Bricklink includes weights of most of the Lego parts. How much does a speedometer weigh in grams? The reason I would like to know is because I would like to know how much money I would have to pay on bricklink.com for it and some other things. Hi Sariel. 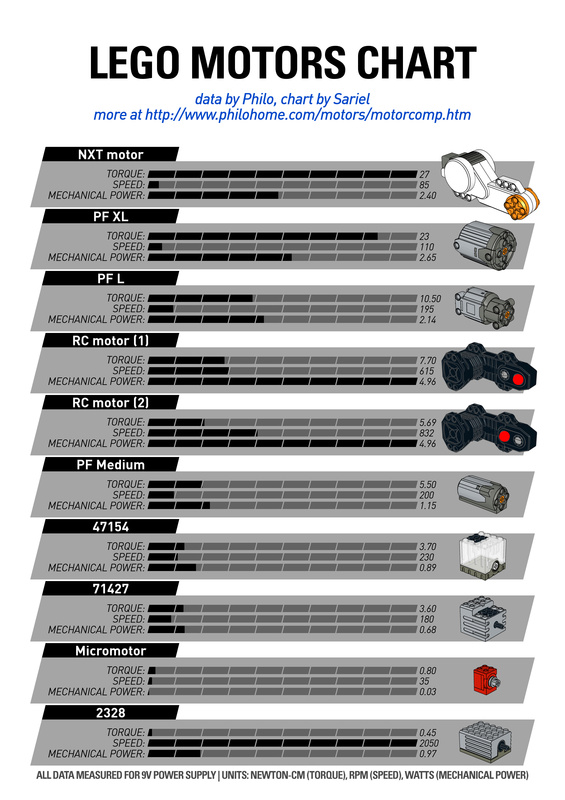 I know u’re really interessted by motorized gearbox. Sorry for the explications but there are in french. Cool gearbox. 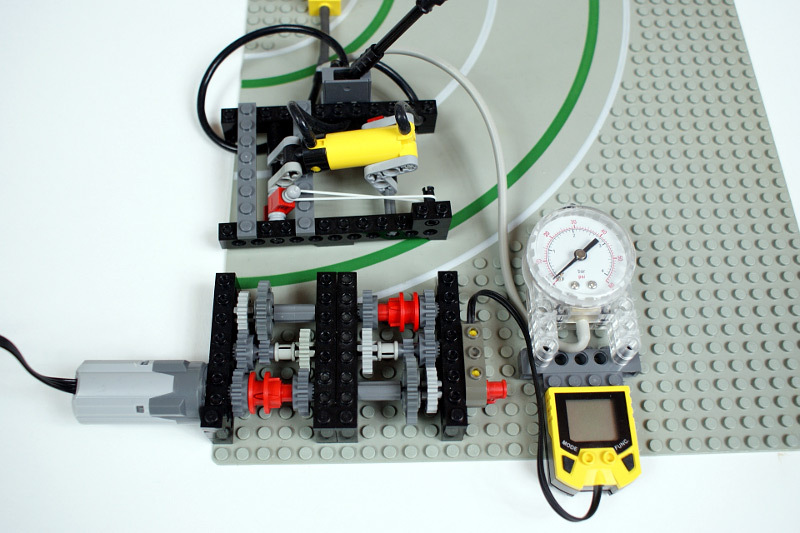 How can you find a lego speedometer on peeron or bricklink? As soon as I learn to. You have been saying by every gearbox that the are not good for TrTr but can you show, or make one that is good for TrTr. But which is stronger ? Strength is not needed for this gearbox to work. It works perfectly well with pneumatics at a relatively low air pressure (as seen in the video). Not a good idea. It’s too long and you would need to add clutch to prevent it from tearing the gearbox apart. I was wondering if it would be possible to use a linear actuator instead of the pneumatic cylinder. On another note, I’ve been enjoying your website over the past few weeks! I wish I have such opportunities wich constructing. I think it’s possible, but I never really had a need for reverse gear since since I drive all my gearboxes with electric motors that can be put on reverse easily. Nice gear box design – love the site also, do you tink its possible to convert it into a 3-R or 2-R gear box?? I’m just a linguist, I have no engineering background whatsoever. Sariel (paul), could I know your educational and other qualifications, like from which field you did complete your graduation, post-graduation and all that ? I use MLCad. All the things I build can be obviously built with self-collected parts (in fact, they ARE built in such way). And for shopping it’s BRICKLINK! Good work, you are a awesome LEGO TECHNICian. You use Ldraw, but what are you using as second generation editor MLCAD or LeoCAD, if using neither please tell. 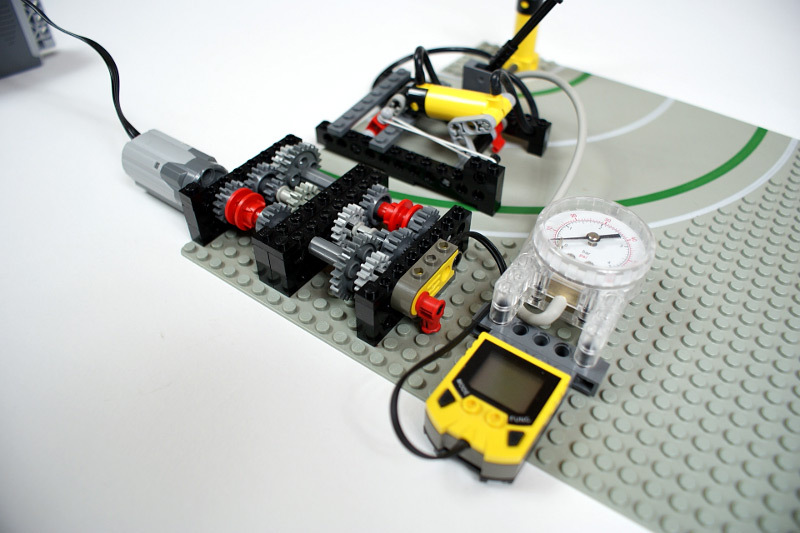 And all this stuff you create with LEGO TECHNIC can also be done with individual self collected parts ? 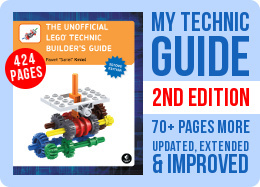 And how can I buy LEGO TECHNICs online, how will it cost ? Tak, próbowałem. Nie, jestem tylko po filologii. Nice work! I built it myself, and found, trying to make it more suitable for RC, that it doesn’t work to build a ‘shifter’ by hooking up a regular cylinder to the one on the gearbox. It does work, however, to hook up one of the old extra long single-acting cylinders. I put a short hose from that cylinder to the base of the cylinder on the gearbox and it works very well. I’ll try to get some pics up on my Brickshelf today or tomorrow if you don’t get what I’m saying. I built the gearbox and the only time the gears skip is when the gearbox is in 5th gear. Other than that the gears don’t get damaged at all. It was done in LDraw. What kind of use cad S/W? Gearboxs image is very nice and quality. Clever and unusual, but I fear gears may get damaged when meshing at angle. what do you think about this gearbox? I have used the old type axle connectors. hey sariel, couldn’t you use the old type of axel connectors (the ones where the clutch clicks while passing) in stead of the smooth ones? in this way, you could control the switching much easier, but if you use the new (smooth) ones, that would provide a faster switching….. It won’t work, because if multiple cylinders were used, they would have to be switched in order. So it’s more likely that more rubber bands would be used. And filling cyinders with water destroys them. and fill it with water or something. The second zylinder is connected to a pf motor. So you can change the gears remotly. I think it´s simplyier than the auto valve. Very smart design. But what I really would like to see is how you plan to control it. I can tell from the video that in order to use all gears you need a dual control: (1) position of the pneumatic switch and (2) air pressure in the yellow cylinder. Second question – apart form its size, would linear actuator work as well? Co do Bricklinka, można dokonywać zakupów płacąc przez system Paypal – ten system można powiązać ze swoim kontem bankowym, więc zwykłe konto np. w mBanku (w moim przypadku) całkowicie do takich zakupów wystarcza. Przeliczanie ze złotówek na dolary i inne waluty zapewnia Paypal, bank nie jest w to zaangażowany. yeah, zblj’s cvt improves vastly in terms of design than that of misha van beek’s. i also love how the maximimum and minimum ratios can be adjusted. however, on the subject on stalling- does it simply stall as the motor runs out of torque in the lowest ratio? I actually have a working, somewhat modified copy (I’ve changed it to fit in narrower space) and it works wonderfully. My only concern is that it is possible for the resistance to stop this gearbox. Not easy, but possible. No, I could, but I want to test the CVT gearbox invented by Zblj. Very interesting! Will you use this one as the “automatic CVT gearbox” in the Reventon? I love the way that the elastic band makes sure that the gears change in a certain order! I also like fact that there are no sliding axles and the setup of gears is a very nice idea. while the gearbox design is very clever, my personal favorite part is the use of the pneumatic cylinder to actuate two levers. simple, and yet effective. Good Design, this has more application than a standard four speed, and can be controlled easier for more application. Though the gearbox has to pass through neutral when shifting between gears. Like other gearboxes this limits it application to something that needs continuous power, but cannot afford to lower the speed (and therefore power) of a PF motor by use of the PF speed control IR transmitter. In a Truck Trial application, where the need for a gearbox like this can be really useful, it would be helpful to have a gearbox that can change gears without loosing power for the short time between gear changes. Automatic gearboxes, like the 2 speed you designed, are also helpful but lack the strength and syncronation of gears that some models need.